Broccoli is one of the few vegetables I often make for our family side dishes during lunch and dinner. It is the only vegetable my sons eat without a fuss. Since I want them to eat vegetables frequently. 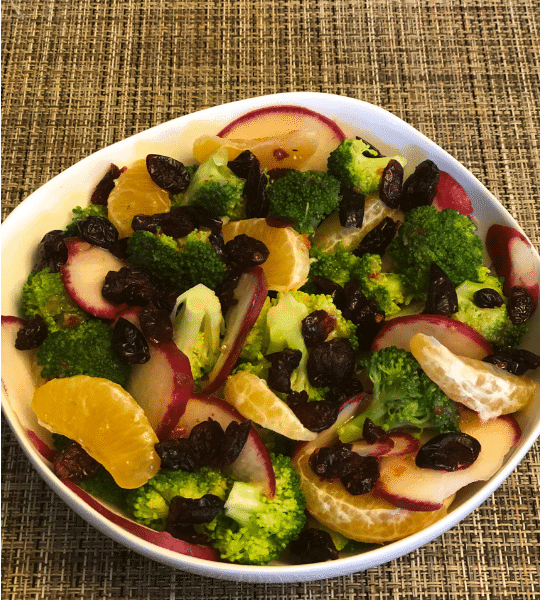 To get my kids to eat more salads because they are healthy, I add broccoli to the dishes they eat frequently. They enjoy and like them. I like making this salad colorful and straightforward by trying to balance the ingredients. I do this by adding a few ingredients with a little bit of homemade dressing since I want to retain their natural flavors. 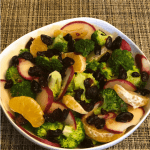 This broccoli salad recipe is vegan and gluten-free, hence great for vegans and vegetarians as well. The fat/oil content in it is very low, and it doesn’t have any dairy or nut products. I believe anyone including children can enjoy it. You can make and eat it often without being bored with it. 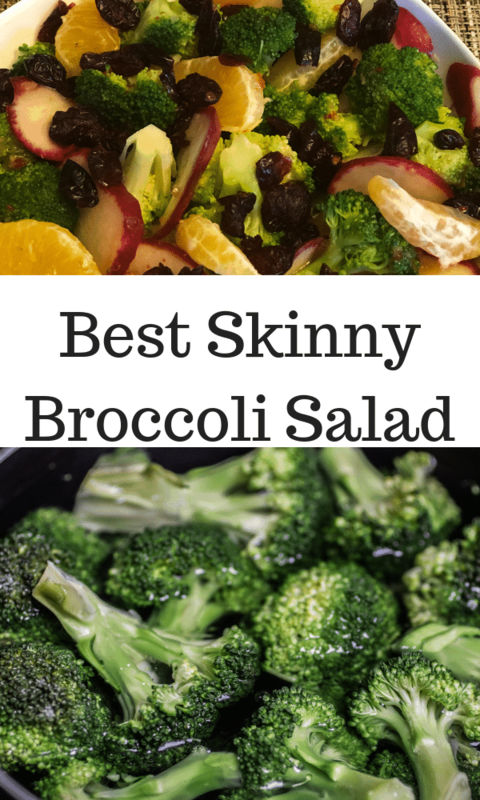 The salad is very nutritious and excellent for a side dish or on the go. Pack it in your kid’s lunch box or carry it to work. Eat it as often as you can to get all these health benefits. It has fewer calories and has plenty of fiber hence great for weight loss. The broccoli salad recipe is fresh, crunchy, and delicious and good for your health. It is great for detoxifying your body since it has other great ingredients that aid in cleansing the body. This salad recipe is very nutritious and good for your health. It has the necessary photo-chemicals great for nourishing the body. The vegetables such as; radish, broccoli, and the fruits raisins, orange, and honey contain vital nutrients. They have high amounts of; vitamins, minerals, fiber, antioxidants and special enzymes which your body needs. These nutrients help flush toxins from the liver naturally. They are great for detoxifying and cleansing the body. Broccoli has anti-inflammatory properties that help to lower inflammation. If you suffer from inflammatory ailments, hence you probably need to try to eat more broccoli. Their anti-inflammatory effect help reduces the chances of you developing cardiovascular diseases. 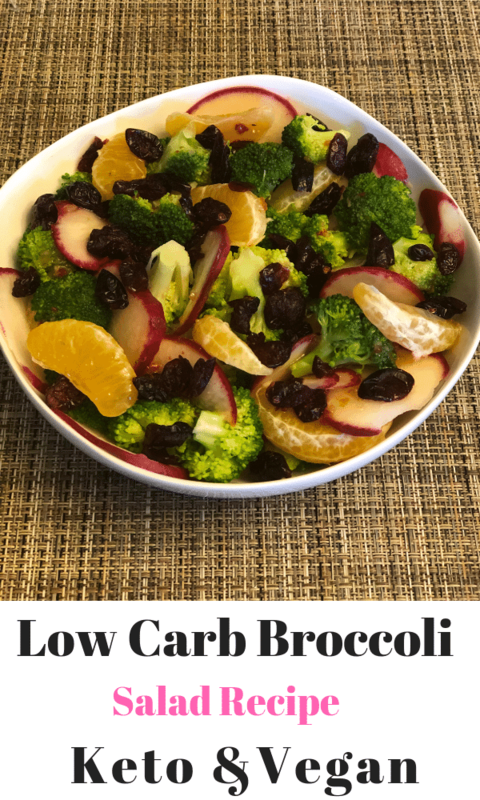 The broccoli and the ingredients added to make the salad are full of; antioxidants, vitamins, and immune boosting compounds. These nutrients help to reduce free radicals and prevent the generative deterioration of skin. Eating broccoli often helps make your skin look radiant, younger and healthy. They can, therefore, slow down the aging process. How to retain nutrients in your broccoli salad. You only have to clean and cut the broccoli according to the size you want. After that boil or steam it slightly and do not overcook it. Moreover, overcooking any vegetable destroys the vital nutrients. You can as well use raw broccoli if you like. In fact, you will get all the vital nutrient without losing any. Drain the water if you steamed or boiled it. You then add the rest of the ingredient and your salad is ready. For the dressing, you will need only three ingredients which are; honey, lemon, salt. Mix all the ingredients in a separate bowl then pour it on your salad. This simple dressing is less oily but will make your salad tasty. Clean the broccoli cut them and put them in a large bowl. Add the thinly chopped radish, raisin, and oranges and combine well. Add the dressing by drizzling it over the salad and mix well. Allow the salad to chill in the fridge for 45-minutes before you serve it or eat it immediately. Your salad is ready, enjoy! Please try this salad and let me know if you have any questions for me in the comments below. Don’t forget to subscribe to get my latest and popular recipes in addition to health tips for free.